The inaugural meeting for the Mason County Kitty Korral was recently held at Village Pizza Inn in Point Pleasant, updates on the group can be found on their Facebook page Mason Co. Kitty Korral. 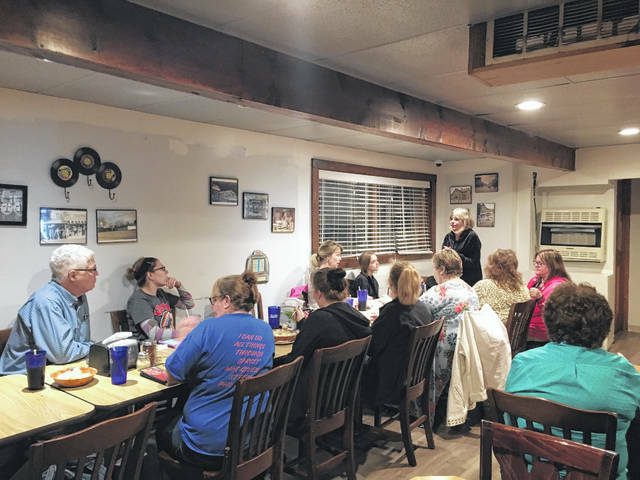 POINT PLEASANT — The Mason County Kitty Korral recently held its inaugural meeting with members discussing grant applications and possible fundraisers. The Mason County Kitty Korral was formed as an initiative to bring a Trap-Neuter-Return (TNR) program to Mason County, so stray cats can be spayed/neutered without cost and then released back to their homes. Camala Simpkins, Kitty Korral co-organizer, explained to fellow members one of the main goals before their next meeting will be to complete the group’s 501c3 grant application as she wants the application turned in by March 1. Also, for help with attaining future grants, Simpkins is seeking out an individual who can be the designated grant writer. Other funding for the group was discussed and members shared fundraising ideas. Renee Wickline, Kitty Korral co-organizer, suggested a spaghetti dinner. After some discussion, the members agreed to hold the dinner which is tentatively set for April 11. The “Spay-ghetti Dinner” will be held at the Henderson Community Building with each meal consisting of spaghetti, salad, bread and a dessert, cost $7 per meal. The members will be focusing on acquiring donations from local businesses. Wickline shared on the group’s Facebook page, Mason Co. Kitty Korral, some of the suggested donations needed for the meal including spaghetti, sauce, Styrofoam containers, plastic ware, napkins, salad (preferably bags), salad dressing (preferably packets), desserts, and plastic bags. To help give the group a push, Mason County Commission President Rick Handley gave a donation on behalf of Handley Law Office. Simpkins said she will be making a flyer about the“Spay-ghetti Dinner” to be given out and put up around the county. Also, she will be sending out a newsletter about the Kitty Korral to local businesses. For additional donations from the community, Simpkins suggested members put out donation cans at the local businesses as well. Also, a few members of the group will be attending a trapping demonstration behind Piggly Wiggly by representatives from Operation Fancy Free on Feb. 12. Operation Fancy Free, located in Jackson County, has been assisting Mason County with this TNR initiative. In looking at future plans for the group, members were asked to begin thinking of a location where a cat colony could be set up. Also, one member suggested asking establishments if they would be interested in having a cat on their land to act as a natural pest control, creating “working cat” program. Members also discussed having foster owners for pregnant cats. The foster owner would take in the pregnant cat and her kittens until the kittens were weened from their mother. Simpkins reminded fellow members to keep in mind some of the necessities they will be needing such as traps, crates, cat covers, cat food, and medicine to name a few. For those seeking additional information about this group or how to donate to this cause or become a volunteer, contact Simpkins, Wickline, or the Mason County Animal Shelter. The Mason County Kitty Korral will be meeting once a month, meeting information will be posted on the group’s Facebook page. Volunteers/members of this group will be helping with fundraising initiatives, trapping and releasing cats, transporting cats, and feeding/tending to the cats.